Flying Solo (Dragonfly Mandala (Haiga & Collage), 4/52, BlackBerry 52 – WEEK 4, January 30th 2011, photo © 2011 by QuoinMonkey. All rights reserved. Medium: Drawn by hand with a black Ultra Fine Point Sharpie on Canson Mix Media XL Series 98lb drawing paper. Collaged & colored with Faber Castell 6 PITT Artist Brush Pens, DecoColor Glossy Oil Base Paint Markers, Portfolio Water Soluble Oil Pastels, Caran D’Ache NeoColor II Water Soluble Wax Crayons, Lineco Archival PVA Adhesive, archival card stock paper. Poem by QuoinMonkey. Photo taken on Canon PowerShot G6 camera. chase mayflies — things are not what they seem. I feel a kinship to Dragonfly; I first wrote about her shadow in May 2007. In the Summer of 2010, dragonflies filled our gardens. I spent a hot July day kneeling on one knee, contorting the body so I could get my BlackBerry close enough to capture the veined wing. Dragonfly wings carry golden drops of magic. 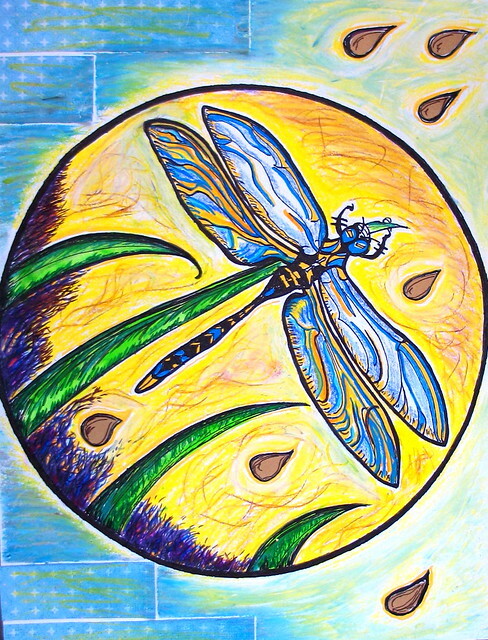 In Dragonfly Wings — It Is Written In The Wind, I wrote about the meaning of Dragonfly in the Medicine cards. During The Sketchbook Project, Dragonfly resurfaced in a Bone & Moon Series of loose sketches; I wanted to recreate the drawings in mandala form. When I saw Through the Rain-Studded Screen (haiga), the Jump-Off from Lotus for Week 4, I connected to the rain, and wondered what it would be like for a dragonfly to navigate through a downpour. The response — Dragonfly in Yellow Rain. In BlackBerry 52, we will continue our call and response by posting a BlackBerry Jump-Off photo every Monday for the 52 weeks of 2011. Feel free to join us if you wish (learn about the project’s beginnings at BlackBerry 52 Collaboration). This is absolutely a stunningly gorgeous mandala, QM! I’m nearly at loss for words to describe how wonderful this response is to my Jump-Off! I love the energy vibrating from this piece through the yellows and blues. It is a balance of color against the grays of rain. Thanks for the background in the dragonfly adventures you’ve had. I think you captured every detail of the dragonfly (extremely well, in fact!) in this drawing. I also feel the magic, love, and hours of hard work put into this lovely piece. Bravo! Well, A~Lotus stole my word…”gorgeous”. I love dragonflies too and until I read your other piece, I did not know they were around during the time of the dinosaurs. I always suspected it, but never verified the fact. I was curious about the choice of “yellow” for the rain. Did you have a specific meaning for that color? Or was it an aesthetic choice to go with the other colors? I love this, QM! The colors are so gorgeous, and those little drops of moisture, well those are my favorites. And how you colored the wings. Really wonderful!! Lotus, thank you! I am liking this collaboration. It inspires me and gives me a deadline to create art every few weeks. Also moves me to choose different kinds of photos for the Jump-Offs. I posted the new Jump-Off for Week 5 tonight. It’s kind of a strange one. Teresa, thank you so much. The yellow rain…hmmm. When I envisioned the dragonfly piercing the rain, it made it easier to think of raindrops as sunfilled drips. I guess that’s where it came from. I also liked the sound of the way “dragonfly in yellow rain” rolled off the tongue. ybonesy, thanks for stopping by. You’ve inspired me to start to collage! I just dabbled in this one, but the raindrops are actually gold card stock. I chose the number 7 — 7 drops. Magical number. The drops reminded me of Yods in the Tarot. I really had fun with the wings. I could see doing a whole series of these mandalas just on dragonflies. BTW, I mixed the oil pastels and the Caran D’Ache and really like the way they blend together. I also found that the DecoColor Paint Markers and the Faber Castell Art Brushes both covered the Caran D’Ache wax crayons. I was happy to find a marker that wouldn’t get clogged up lining over the wax. Oh, Teresa, I wonder what it is about dragonflies? I think they are just so strange looking and beautiful at the same time, not what you see out there every day. I am not good at identifying different kinds of dragonflies. So last year on the way up to Ely, Minnesota for the LilyPad picnic, Liz and I stopped at a state park and I bought a book on dragonflies. I’d like to get better at knowing which ones I am looking at. We’ll see how it goes this Summer! This is stunningly beautiful, QM. I love dragonflies. I’ve been known to spend hours just sitting and watching them flit about on the pond. The wings really are beautiful, QM. It looks as if you captured the 4 elements in them… the mandala produced the 5th 🙂 Thank you for sharing it. annieoakcake, I like that notion — the 5 Elements. Thank you for pointing that out. And again, Happy Birthday! BTW, QM, did you use your amazing dragonfly photo to help guide you as you drew your dragonfly? Collage is powerful in art. I hadn’t realized it, but it can break open a creative process. I’m not sure why. I guess the only thing I’ve deduced is that it’s not a very precise medium, at least not that I’ve found, and that has had a good effect on my work at least, helping me to loosen up and experiment. I’m glad you were inspired to try it. I’d be interested to hear about what it felt like to you. ybonesy, I think you hit the nail on the head…collage can be a loose art form. I have not done it as much as you have or experimented the way you have. But I watched Liz play with it in her Sketchbook Project which made me want to try it, too. I just added a little paper to this one, can really use it to open up a lot more on the next ones. I liked mixing it with the drawing. I am not precise with drawing and sketching the way I am with my photography. Photography is really the medium I know the best. I think that’s why it’s fun for me to keep a sketchbook. Now that I think about it, the collage reminds me of classes where I used a lot of alternative photographic processes, like cyanotypes. When I did those, I had to collage together drawings and pieces of text that I had copied on to plastic film, then exposed on to the rag paper. That is a time when I depended on the looseness of collage. But I haven’t done it much since. This is giving me the chance to try it on a smaller scale. 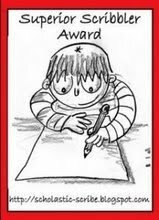 yb and QM: I’m enjoying your dialogue about the art process. It is very fascinating. I love breaking things down into detail too. For me though, I like things in some form of symmetry and balance with a bit of a surreal/mystical quality to it, which I’m sure you could tell from our BB 52 Collaboration. I have a question for you and Yb. I’m working on a collage right now involving flower pressing. Is there some kind of fixative for the flowers? I’ve dried them out and have glued them on paper but I want to flowers to last instead of break down… Any suggestions would be appreciated. I meant to say: “I want the flowers to last…”! Ditto to everyone else’s opinions. The first thing I did was go to your beautiful and amazing photo of a dragonfly. oliverowl, thank you for stopping by. I love that about fairies flying around on the backs of dragonflies. Makes total sense to me. Lotus, just getting to responding on your question. Been a crazy week on the homefront. I honestly don’t know what people use to preserve pressed flowers that way. I wonder if you can use the same kind of fixative that ybonesy mentions, a spray fixative you can get in any art store. I’m just not sure. I might throw the question into Google and see what comes back. Maybe some good research sites on pressing flowers will pop up. I’m looking forward to your art work this week! So lovely–Annie had a dragonfly tattoo–so now I collect dragonflies. Linda, I will think of you and Annie the next time they are in season. Dragonflies are so amazing when they sail on the wind. Very nice. There is a colorful elegance about that butterfly, quite calming actually. Thanks, Quillan. I appreciate you stopping by. I’m looking forward to seeing the first Dragonflies of Summer. In the meantime, I draw them and keep checking in on the Dragons. The first dragonfly stopped by the Valley this afternoon. Liz videotaped it in the swampy grass over in the park. The frogs came back this week, too. They are SO LOUD. I love hearing them in the distance. Beautiful music.